Aquifer congratulates Valerie J. Lang, MD, MHPE, Aquifer’s Academic Director for Assessment, on receiving the Ruth-Marie E. Fincher, MD, Service Award. This award, presented by the Clerkship Directors in Internal Medicine (CDIM) at their Annual Meeting, recognizes a CDIM member who has made an outstanding contribution to the organization. CDIM is a member organization of the Alliance for Academic Internal Medicine (AAIM). Dr. Lang’s current and past national committee work for AAIM and CDIM includes serving on the Clerkship Directors in Internal Medicine (CDIM) Council; as CDIM President (2014-2015); on the AAIM Board of Directors; and as Co-Chair of the AAIM High Value Care Working Group. She is an Associate Professor of Medicine in the Hospital Medicine Division at the University of Rochester. Dr. Lang directed the Internal Medicine Clerkship for 13 years and the Medicine Sub-Internship for 15 years. 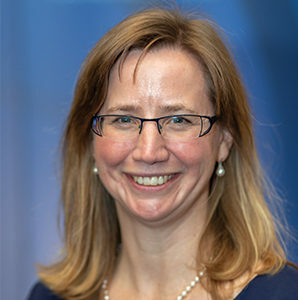 She currently directs the Hospital Medicine Faculty Development Program and is the inaugural director of the Meliora in Medicine course and thread through all 4 years of the medical school curriculum. As the Aquifer Academic Director for Assessment, Dr. Lang provides strategic guidance to inform Aquifer’s non-profit mission of advancing health professions education. She is currently leading the development of innovative new formative assessments for a range of disciplines, and led a multi-institution validation study of Aquifer Internal Medicine’s Clinical Decision-Making Exam (formerly the Key Features Exam) that was recently published in Academic Medicine. She is also a past Co-Editor-in-Chief of the Aquifer Internal Medicine course. All of us at Aquifer congratulate Dr. Lang on receiving this national honor.